Gauges 09-11-16-24-32-42.Whether you know it or not, chances are you've tried these strings and liked them time after time. Nickel-plated Steel Super 250s are installed at the Fender factory on all U.S. and Mexico non-tremolo electric guitars as original equipment! If you want to keep your guitar factory fresh, look no further! Whether you know it or not, chances are you've tried these strings and liked them time after time. 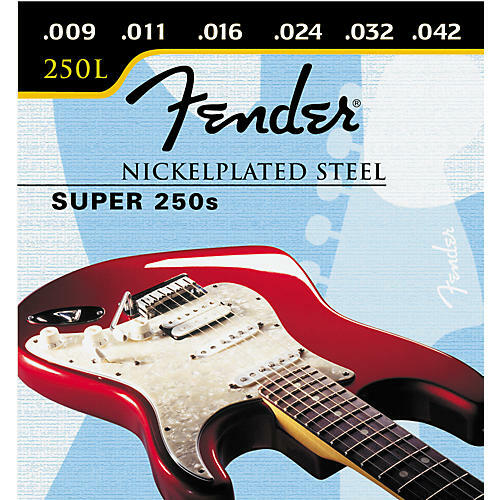 Nickel-plated Steel Super 250s are installed at the Fender factory on all U.S. and Mexico non-tremolo electric guitars as original equipment! If you want to keep your guitar factory fresh, look no further!